I should warn readers at the outset that the title of this book is probably the most interesting thing about it. 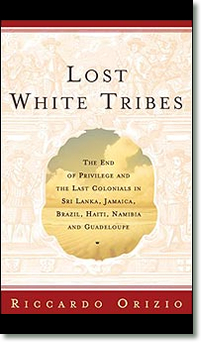 The idea that there might be such as a lost white tribe subtly subverts our sense of the natural order of things. As provocative notions go, it offers the promise of a good read, and it certainly persuaded me to go tagging along with Orizio, an Italian journalist who is now a senior editor at CNN, as he travels to exotic climes to rediscover the descendents of white people abandoned like flotsam on the beach by the great ebb tide of European colonialism. Among them, we meet descendents of the Dutch East India Company in their crumbling mansions in Sri Lanka. They made their peace with the British when that country seized control of the island but were not so lucky when it reverted to the native Sinhalese, who wanted nothing to do with any white presence on their island, however far back it dated and however highly it regarded itself. Then there are the Germans whose ancestors were tricked into emigrating to Jamaica when slavery ended and skilled workers were needed to work the sugarcane fields; the impoverished, egregiously inbred Frenchmen in Guadaloupe who trace their ancestry back to the pre-Revolution French aristocracy; the tiny clutch of Poles deep in the mountains of Haiti, descendents of mercenaries brought to help crush that country's struggle for independence but spared by the victorious leaders of the slave revolt from the otherwise merciless slaughter of whites -- because Poland, too, was a country struggling for freedom. Less hapless, perhaps, but no more successful are the two remaining groups. One is made up of descendents of Southerners who migrated to Brazil at the invitation of that country's emperor after the Civil War in hopes of reestablishing the Confederacy not only south of the Mason-Dixon Line but south of the equator as well. The other is a group of Dutch settlers in South Africa who kept heading north into the Transvaal in search of a place where they could found their own nation, only to discover that history had the habit of catching up with them and spoiling their plans at the last minute. "Too poor to leave; too proud to assimilate" might be the motto for all of these groups, certainly at this point in time, and one wonders if Orizio expected to keep uncovering this dismal truth over and over again. Each of these enclaves, however otherwise unique, proves to be similarly pathetic and energetically offputting, clinging fiercely to racist notions about themselves and fantasies about their importance in the natural scheme of things, while waiting for rescue -- by the Pope, the United Nations, the governments of their former homeland -- from a life of misery that is pretty much of their own making. In fact, a careful reading of these pages soon reveals that anyone born into one of these communities who possessed any gumption and native intelligence left for another life somewhere else as soon as possible. This means that natural selection has left behind a bunch of -- how can one say this politely? -- incurably self-delusionary racists, who blame everybody for their troubles but themselves. The most interesting person in the book is one of the Blancs Matignon in Guadaloupe who found in the Jehovah's Witnesses a belief system powerful enough to replace the illusions he grew up believing and so was able to marry a black woman and raise a family of very healthy, normal-seeming children. It is one of the rare times in the book when you can feel the presence of happiness, even laughter. Lost, yes, but least of all in the way that Orizio means; we haven't lost them or they us&emdash;they've just somehow lost themselves, and that from looking in all the wrong places. What kept me reading the book is that these forays take us into parts of the world where few travel writers ever venture -- down the backroads of nowhere to visit no place at all. For example, the Confederados do Campo (and what an unappealing lot they are) live in a part of Brazil that is treated by the Brazilians themselves as if it doesn't exist. [T]he territory that wavered before us seemed monotonous and inaccessible. This is what Brazilians refer to, with bored indifference, as the Interior Paulista. The term has come to indicate an attitude as much as a geographical location, because although the state of São Paulo has great natural diversity -- from mountains to plains, alpine firs to banana palms -- it is as if, beyond the skyscrapers of São Paulo's avenidas, beyond the illusion of this poor man's Manhattan, lay only a dreary wasteland, its towns and cities unworthy of being identified by name and hence anonymous. And they say that for a Brazilian anonymity is worse than prison. But these places are far from anonymous to those who live there, however resigned they may be -- even embarrassed about -- that fact, and for the attentive visitor there is much to surprise, inform, and even delight. 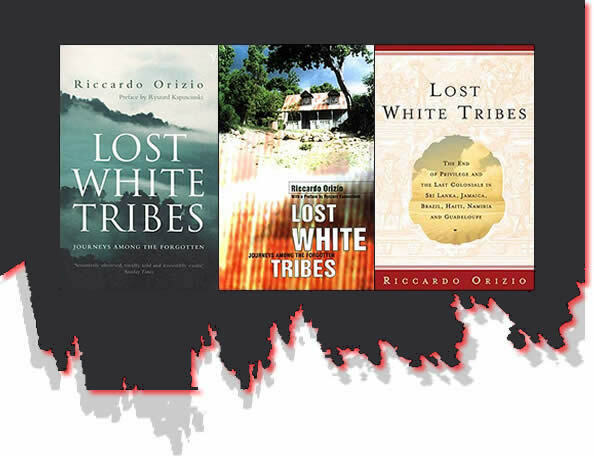 In Lost White Tribes, an island the size of Haiti or Guadaloupe is transformed into huge and an amazingly complicated universe where each valley and hill possesses its own fiercely guarded story. The book left me reeling from a newfound awareness of the depths of my ignorance about the world. From that perspective at least, what Riccardo Orizio has revealed is how much each of us unwittingly belongs to our own lost tribe.